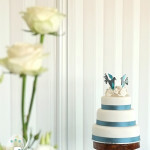 There is no denying that vintage-inspired ruffle cakes are one of the most popular styles of wedding cakes at present. And for good reason – they’re beautiful, romantic, and although similar, no two are ever the same. Which sort of sounds like a wedding day, to me! Nicole and Joshua celebrated their wedding day at the beautiful Rainbow Shores in Rainbow Beach. I so enjoyed creating their special ruffle cake, and I am delighted to share some images with you below, which were very kindly sent to me by the gorgeous bride and groom. Thank you to Nicole & Josh and also to Milque Photography and Films for permission to share their absolutely beautiful work! 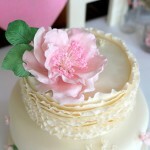 A personalised cake topper, edible ruffles, and two shades of frilled rose-like fantasy flowers decorated the cake. Photo by Milque Photography and Films. 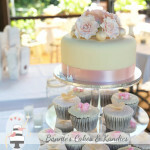 Along with rows upon rows of delicate icing ruffles, the cake was decorated with frilled rose-like fantasy flowers in light pink and dusty rose colours. The finishing touch came with the placement of a special, personalised cake topper spelling out the names of the bride and groom. 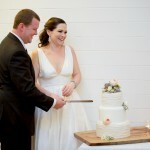 Carrot cake and caramel mud cake made up the two tiers of Nicole & Joshua’s Rainbow Beach wedding cake. Photo by Milque Photography and Films. 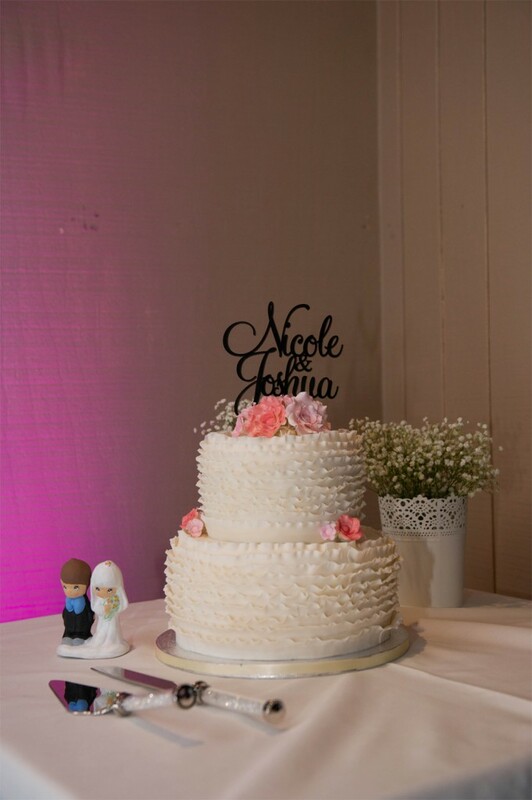 Nicole and Josh chose a different flavour for each tier of the cake, with the top tier made in carrot cake, and the bottom tier in caramel mud. Great flavour choices! 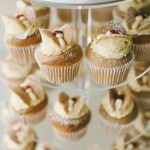 Both were filled with my white chocolate buttercream, and covered with delicious, ivory-coloured white chocolate fondant. With Michelle Gadd Registered Civil Celebrant taking care of the marriage ceremony, and Amy from Rainbow Shores ensuring that the day went perfectly, you can see just how happy, relaxed and beautiful the newlyweds look as they cut the cake together! 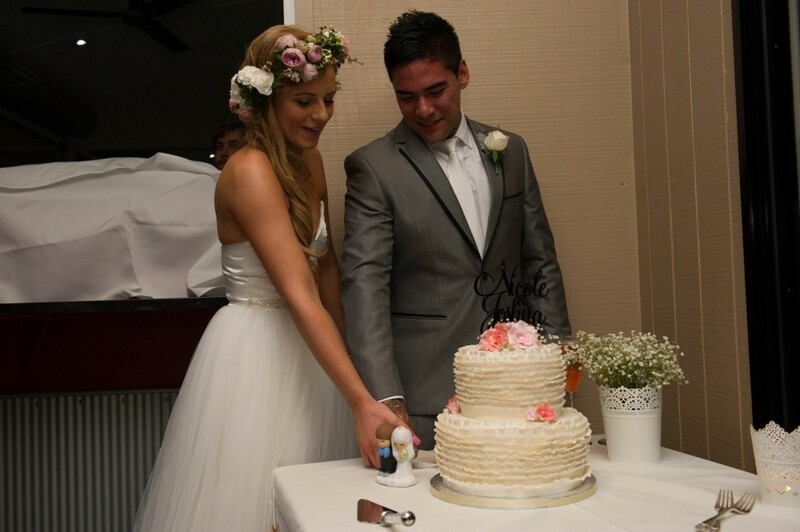 The beautiful newlyweds looking so happy as they cut their wedding cake. Photo by Milque Photography and Films. 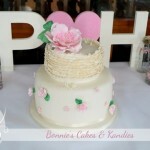 Cake by Bonnie’s Cakes & Kandies. Venue: Rainbow Shores, Rainbow Beach. What a beautiful couple! Thank you again to Milque Photography and Films for permission to share the images in today’s post. 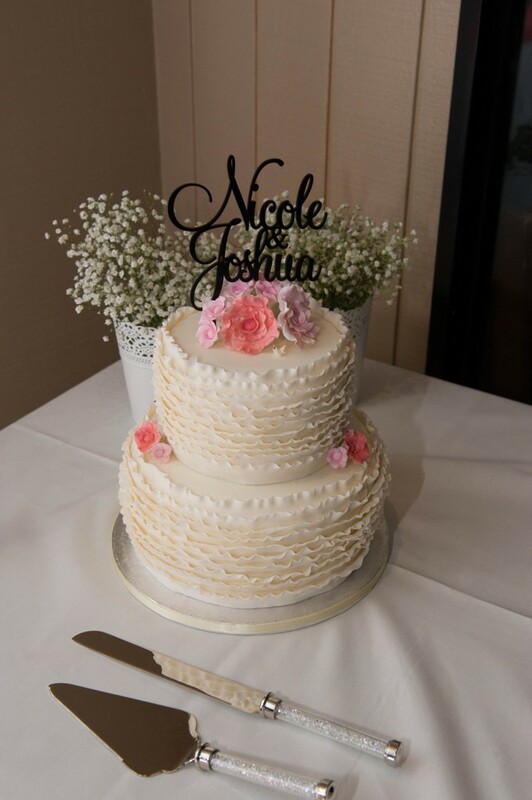 To Nicole & Josh – it was such a pleasure to meet you and to make your beautiful wedding cake. I wish you all the very best in life and in each other!